Employers care about the safety of their employees. They are committed to keeping their employees safe and are hosting distracted driving presentations. Let us work with you to keep your employees safe. “His comments, lessons and personal stories touched each person in the audience in a profound way, as he delivered powerful examples of the dangers at stake when we drive distracted. Joel offered to also graciously present to a local high school on the same day. He was engaging and interactive with the students and faculty, who expressed their deep appreciation for his important, life-saving messages, and for our company’s willingness to bring about the opportunity to hear such a dynamic speaker. Local news media covered the presentation and our sponsorship, and the event received positive public reviews. ” — Mike Mosher, President and CEO Central Hudson Utility Co., Poughkeepsie, NY. “Many experts in the field of personal development suggest that it takes 28 days to change a habit. In the case of Joel Feldman’s presentation on Distracted Driving— it took less than 28 minutes to change my driving habits. His discussion was not only moving and thought provoking, but his sincerity and passion convinced me to change my driving habits, which I never realized were nothing short of criminal, to ones with which I could live (literally).” — Dave Winoski, Project Engineer, Jacobs Construction Co. Featured Distracted Driving Speaker —Joel Feldman. Joel Feldman’s 21 yr- old daughter Casey was killed by a distracted driver in 2009. Casey was a daughter, granddaughter, sister, niece, cousin and friend and her death shocked those who knew and loved her. For more information about Casey go to www.caseyfeldmanfoundation.org. Since Casey’s death Joel Feldman has become a leading advocate for safe distraction-free driving in the US and Canada. He created EndDD.org, a website developed to educating others about the dangers of distracted driving. Working with Children’s Hospital of Philadelphia (CHOP) he has developed science-based distracted driving presentations that incorporate behavior communication and change theory and other concepts to maximize their effectiveness. He is frequently interviewed on radio and TV, with appearances on the Today Show, Nancy Grace Show and CBS Evening News with Scott Pelley. He has produced a number of PSAs that are used in EndDD.org presentations, including one for the U.S. Department of Transportation’s Faces of Distracted Driving series. Joel Feldman is a frequent invited speaker and/or keynote speaker at national and state traffic safety, youth safety, medical and legal conferences and has spoken at a wide variety of businesses. 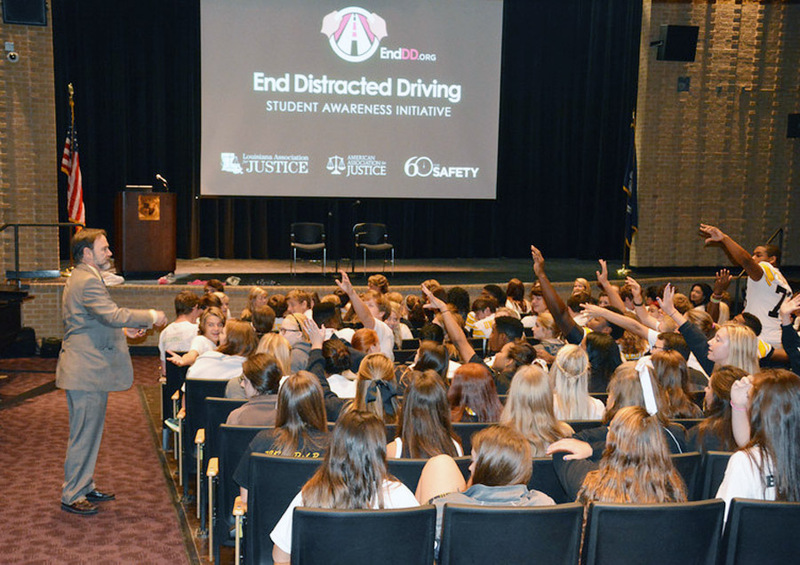 Since 2012 has personally given more than 500 distracted driving presentations to more than 100,000 students and adults in 40 states and Canada. Feldman supervises a network of hundreds speakers across the U.S. and Canada who, collectively, have spoken with more than 400,000 students and adults using EndDD.org presentations. Feldman readily admits that he drove distracted regularly before Casey was killed. “As a lawyer I had represented hundreds of families who had loved ones suffer life-altering injuries or death from motor vehicle crashes, yet it was not until Casey was killed that I realized that I needed to change the way I drive. We just don’t think that someone we love can be taken in an instant or that through poor driving choices we can kill others.” After Casey’s death he obtained his masters in counseling and uses those skills throughout his distracted driving presentations to engage audiences and challenge them to reflect on their driving habits and attitudes in a non-confrontational manner. His presentations are highly interactive and engaging. By telling his personal story of loss, using tragic and humorous videos, role play exercises, audience participation, and scientifically-designed materials he empowers audiences to commit to specific concrete steps for long-term safe driving at home and in the work-place. Presentations have been given in a wide variety of work places, including hospitals, hospices, insurance companies, pharmaceutical companies, financial service companies, utility companies, construction and engineering companies and to many community organizations and commissions. Many employers have also found value in sponsoring talks in local schools in conjunction with work-place talks. Joel Feldman is available for presentations to help educate on the real dangers of distracted driving and how each of us can be part of the solution to End Distracted Driving. To request information regarding scheduling an event email jfeldman@enddd.org. “[Joel’s] comments, lessons and personal stories touched each person in the audience in a profound way, as he delivered powerful examples of the dangers at stake when we drive distracted. Joel offered to also graciously present to a local high school on the same day… He was engaging and interactive with the students & faculty, who expressed their deep appreciation for his important, life-saving messages, and for our company’s willingness to bring about the opportunity to hear such a dynamic speaker.” — Mike Mosher, President and CEO Central Hudson Utility, Poughkeepsie, NY.